Do you want to make use of your craftiness? Do you enjoy embroidering or want to further your knowledge so that you can make a little money? If you love creating embroidery and want to start your own business where you create embroidery for other people to purchase, there are several things you may want to consider. In years past, embroidery machines had only one single head and needle. They are slow and sometimes there are inconsistencies between patterns. It is only in more recent times that single head multi-needle machines became available for home users. This type machine may have between four and ten needles going at any given time. They can each hold a different color and they work so well that you really do not even need to know how to embroider. This type of machine is also quick to get the job done and most people who have tried it, usually just worry about the price, which can be slightly more. However, they admit that it could be worth it for any small business in the making. 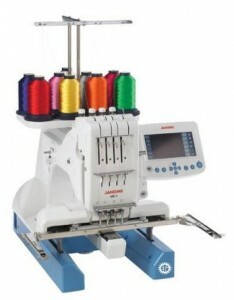 A wide range of embroidery machines is on offer and a beginner may be lost when it comes to selecting the right one. In today’s world of fast advancing technology, acquiring cheap or traditional machines may sometimes be false economy. The latest machines are not only easy to use but also they are easy to upgrade when new innovations come available. Any machine that uses computer software is always the better option. Find one that fits your needs and budget below. Embroidery beginners can take pride in this machine’s touch-screen and the in-built tutorials. This embroidery machine is one of the most sought-after combination machines. 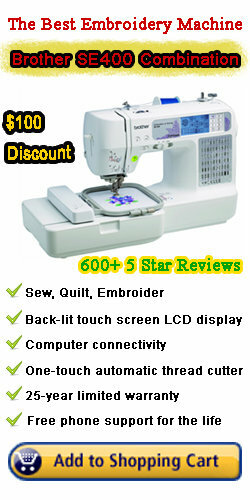 It might be said that it is truly one of the best embroidery machine for beginners. It is also versatile and affordable. Apart from its full range of sewing capabilities, it has many attractive embroidery features ideal for clothing, gifts and home décor. Experienced embroiders as well as beginners can take pleasure in the 4×4 embroidery capacity in combination with the numerous sewing aspects. If 4×4 is not the perfect thing for you, you can try this 5×5 inch embroidery machine and transmit your designs form your computer via USB. Whether for your home, parties or clothing, this machine delivers speed, efficiency and is hustle-free even to new users. 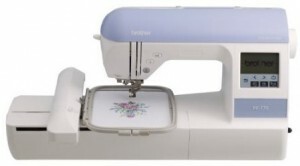 Its ground-breaking features make embroidery and sewing a wonderful experience. Computerized embroidery has never been easier with more than 100 in-built embroidery designs. 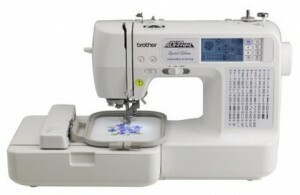 The Brother SE270D is an easy to use but still a cultured combination machine. With an intelligible LCD touch screen, computer connection, automatic needle threader and dozens of automated sewing stitches, adornment such fun. If you love embroidery and applying appliques then you may want to consider purchasing an embroidery machine that can work with the appliques. It is difficult to decide which one will work the best. There are a few features that could be beneficial. When you are trying to find the best embroidery machine for appliques, you need to make sure first and foremost that it will keep the applique steady while you stitch. Your embroidery machine must also be able to handle thicker material types and it should be able to stitch the whole applique because you cannot make the applique any smaller. If you re-size it, there is a lot of potential that you will mess it up. Another consideration is can the machine handle holding the applique in place without adhesive materials? This is really only a consideration if you do not want to have to use nasty glues to apply it with but it is still a valid question. Most embroidery machines can apply appliques however, if you are in the market for a new machine, you should get the best for the job at hand for what you plan to do with it. Embroidery is great. Embroidery machines that allow you to use unique creativity to design monograms on your projects is perfection. You can purchase machines that allow you to do embroidery such as a Husqvarna Husky Star or you can do anything you want with a machine by Brothers that does many different things beyond simple embroidery. Some machines are basic and you have to work at creating embroidery masterpieces. You can put in a little less effort and get more out of a machine that does both sewing and embroidery. If you cannot get the embroidered monogram to work the way you need it to, you can sew one. A combination machine is every monogram-er’s dream come true. With a machine like Brothers created, you have many different design styles and a few different fonts already programmed into the machines memory. If they are not what you need, you can download other designs and font styles for it. It depends on what you want to be able to do. Are you new to embroidery machines or do you need to know what new technology has made it possible to do with a new machine? There are several things you need to know about before you purchase to ensure you get the best embroidery machine for the money you spend on your embroidery machine. Do you want a single needle machine or one with many needles? The single needle is going to be slower. Perhaps the Brother SE400 will fulfill the jobs you want to do with it. Other aspects of purchasing a new embroidery machine are similar. Each machine type will have pros and cons. You need to figure out what it is you are looking for. It will only be when you have found the one you want that you will feel the money is well spent. For example, many embroidery machines are catching up with technology. 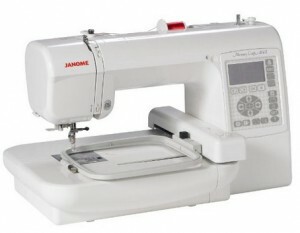 If you are not sure about computers, then you may want to avoid a computerized embroidery machine. However, if you can use computers well, you can do amazing things with this type of machine. It should be easy for you to use or it will not be worth the price. Does it do larger projects or just smaller ones? When you purchase a machine, you will want it to do what you expected it to do. Sometimes a small embroidery field can be difficult to work with, other times a larger field is just too unwieldy. Do you want to work on kids items? 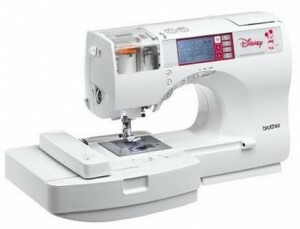 Most programmable machines will not embroider Disney characters without making a separate purchase of those designs. When choosing the best embroidery machine for the money, do not hesitate to shop around. You will find the right one in due time and by doing a little research on the type of things you want to create, it will assist you to get the best embroidery machine for the job. 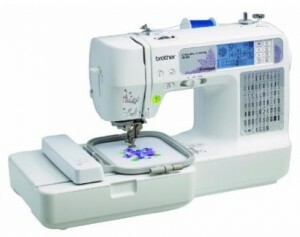 The Brother SE400 Embroidery machine is also a very good alternative for a regular sewing machine. So if you purchase an SE400 you will get two machines for the price of one. 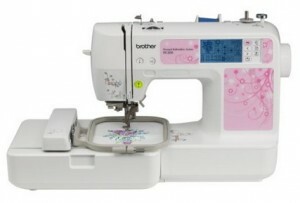 If you need advice from us, we usually recommend the Brother SE400. It has almost all the functions both for home use and small business, plus a price under $300.00 for now. It really is the best embroidery machine for the money.